Once upon a time, salads were made with iceburg lettuce and provided vegans with hours of crunchy fun. Then came the 21st century, when the so-called top chefs of the world decided that iceburg lettuce was for rednecked mouth-breathers and that refined palates crave the nutritious leafy greens that both look and taste as though they were collected from someone’s front yard immediately after said yard was treated with pesticide. You know the stuff of which I speak. And despite the sycophantic head-bobbing and mmm-mmm-ing you feel compelled to do when presented with these bitter snarls of limp weeds, you know you hate it too. Alas, the food snobs have the backing of the nutrition people who proselytize so violently about the health benefits of leafy greens that I’ve become convinced that I will die of malnutrition if I fail to consume them in the recommended vast quantities. 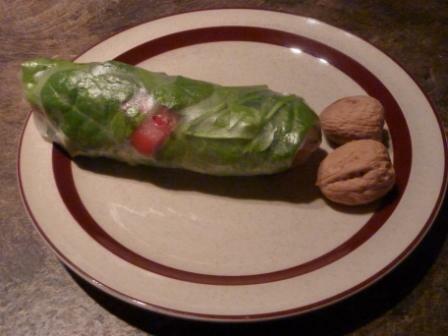 My solution: the Salad Roll. 1) Rice Wrappers. These are available in any Chinatown grocery. Try to find the rectangular ones – some sadist came up with the round ones just to screw with people. 3) Fake meat – my favourite is Nelakee ham log. Tofurky will do in a pinch. 4) Other fruits and vegetables. Use ones that can be sliced into long skinny strips, which keeps them from falling out of the roll. I like apples, peppers, tomatoes, cucumbers, carrots, avocados, enoki mushrooms, etc. I’d advise against celery, unless your teeth have horselike snipping powers. 6) Toasted nuts. This is optional, but it does add a whole other yummy dimension to a salad roll. 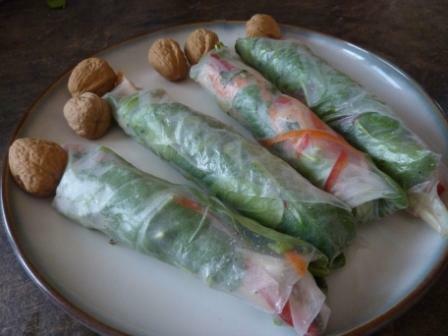 Slivered almonds are my favourite, but whatever you have on hand will work – I used walnuts for the ones pictured below. Set up your rolling area near the kitchen sink. Prepare all of your fillings and have them within easy reach. Place a pan large enough to accommodate your wrappers in your kitchen sink and fill it with very hot water. Submerge your first wrapper in the water (one at a time or they’ll stick together) for about 5 seconds. If you are too lazy to get a pan, holding it under the faucet works too. Place the wrapper on a flat, clean surface. Load it up with your fillings. Pile it on – you’d be amazed how well leafy greens compress. Add salt and pepper. Roll it as you would roll sushi or a cinnamon roll – not trying to get the wrapper around all of the filling at once, but sort of spiraling the filling in. If you’re very dexterous, you can try tucking in the ends, but it really isn’t necessary. If your veggies are in long strips and your roll is pretty tight, everything will stay in. If you had to eat this as a salad it would take you all day and, if you’re like me, you’d just wind up picking out all the tasty stuff and leaving the greens. 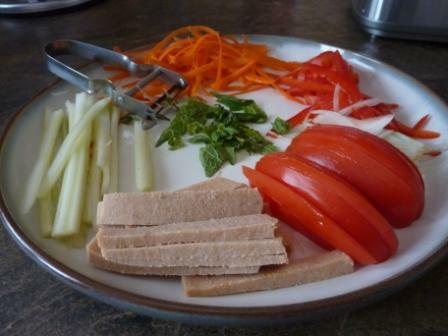 1) Try slicing harder veggies like carrots with a veggie peeler instead of a knife. Less risk of wrapper breakage. 2) Don’t use kale. This salad-improvement strategy can handle the woody bitterness of leafy greens, but the vinyl tarpaulin that is raw kale is a whole different level of eew. 3) Individuals who have served these to new romantic partners have reported some awkwardness.